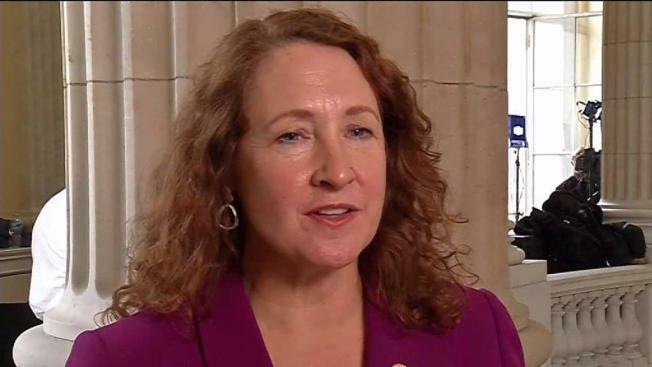 Connecticut U.S. Rep. Elizabeth Esty issued an apology Thursday for failing to protect female employees who say they were harassed by her former chief of staff, including one woman who said she was punched in the back and received death threats. The three-term Democratic congresswoman on Thursday also personally repaid the federal government $5,000 in severance issued to now-fired Tony Baker, according to her current chief of staff, Timothy Daly. Esty issued a public statement responding to a Hearst Connecticut Media article saying she was "horrified and angry" to learn in 2016 that a former employee, Anna Kain, had been harassed and physically harmed, allegedly by Baker. She said she demanded Baker receive counseling. She then conducted an internal review of her office practices, later learning "the threat of violence was not an isolated incident" but a pattern of behavior by Baker affecting many of her female staffers. "I shared my story, but this isn't about me. This is about a flawed system designed to protect powerful people and that isolates and ignores those who need protection most. Abuse and harassment occur in congressional offices far too often, and this problem extends beyond Members of Congress themselves. I implore the Senate to act now to pass meaningful reform. If you work on the Hill and are going through this, I want you to know that it's real, it's a problem, and nothing about it is okay. I hear you and I believe you. It is not your fault and you are not alone. And you are stronger than you think you are," Kain wrote on Facebook on Friday. "To this survivor, and to anyone else on my team who was hurt by my failure to see what was going on in my office, I am so sorry," Esty wrote. "I've asked myself over and over again, 'How did I not see this? How could I have let down so many people?'" Esty, known in Congress for advocating women's rights issues, said she has since hired new senior staff and instituted mandatory harassment training. Daly said Esty was advised by the Office of House Employment Counsel to enter into a nondisclosure agreement with Baker as part of a settlement agreement, which included him being paid his unpaid leave and about $5,000 in severance. Hearst Connecticut Media reported Esty also recommended Baker for a job at Sandy Hook Promise, a nonprofit gun violence prevention organization that was started after the deadly 2012 mass shooting at Sandy Hook Elementary School in Newtown, Connecticut, which is part of Esty's congressional district. Daly said the nondisclosure agreement was "a recommendation that was provided to the congresswoman as part of a means to get Tony out of the office as soon as possible." He said the congresswoman was speaking about the situation now because she believes the agreement is "moot" given the media coverage, as well as her decision that "it's time and appropriate to be transparent." Hearst reported that Baker stopped working as Sandy Hook Promise's state director in Ohio as of Monday. A spokeswoman for Sandy Hook Promise confirmed he is not employed by the organization. Gov. Dannel Malloy released a statement on Friday about Rep. Esty and her apology. "Congresswoman Esty said that she should have handled this situation differently and I agree," Malloy said. "There is absolutely no place for sexual harassment or abusive behavior in the workplace-whether that be the halls of Congress, state houses, or the White House. Every woman--every person--deserves to feel safe in their places of employment. The fact is that there is more work to be done to make this a reality. And I commend this young woman, like the thousands of other brave women of the #MeToo movement, for having the courage to come forward and give voice to victims of harassment. Our society as a whole is stronger because of their strength." Andrew Ricci, a friend and spokesman for Baker, told Hearst that Baker lives in Columbus, Ohio. A phone number listed for a Tony Baker was disconnected. Ricci also told Hearst that Baker denied punching the former female staffer in the back at Esty's Washington, D.C. office. Hearst cited an affidavit from the woman, which became the basis for a temporary protection order and later a year-long civil protection order, that Baker had called her cell phone about 50 times and left messages say he would track her down and kill her. The affidavit also said he screamed at her and said he'd prevent her from getting another job if she reported him to House ethics officials. Ricci said Baker has "spent a lot of time over the past two years becoming a stronger person." He added, "I know he's been living a sober life, and I can tell you anger management was really helpful."